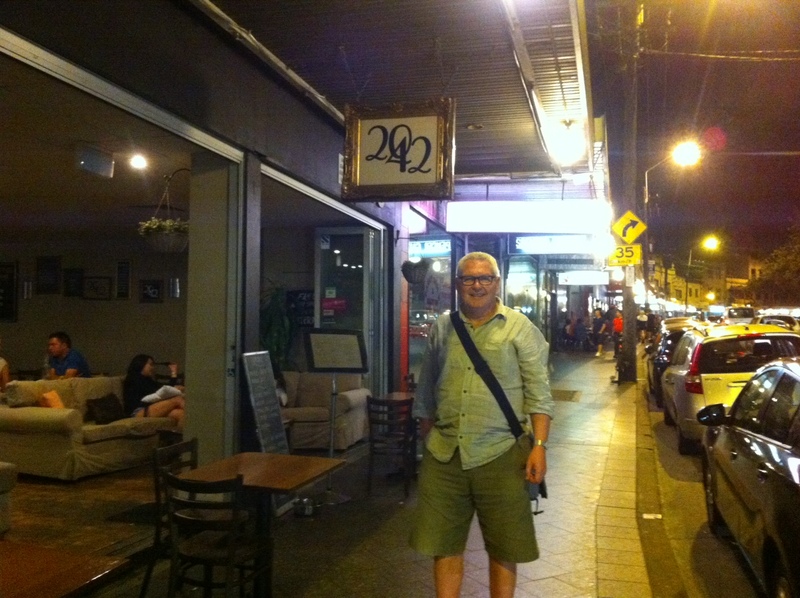 2042 is an odd one – part cafe, part restaurant, part bar – and it calls itself a deli. The name is strange, not giving any clues as to what sort of experience to expect. It keeps unusual hours, and has more room than it really knows what to do with, especially compared to most of its cramped competition. Whenever we’ve walked past it has been fairly empty or closed. This is because it does most of its business in cafe mode during the day when we are not about, it is only open for dinner on Friday and Saturday nights. 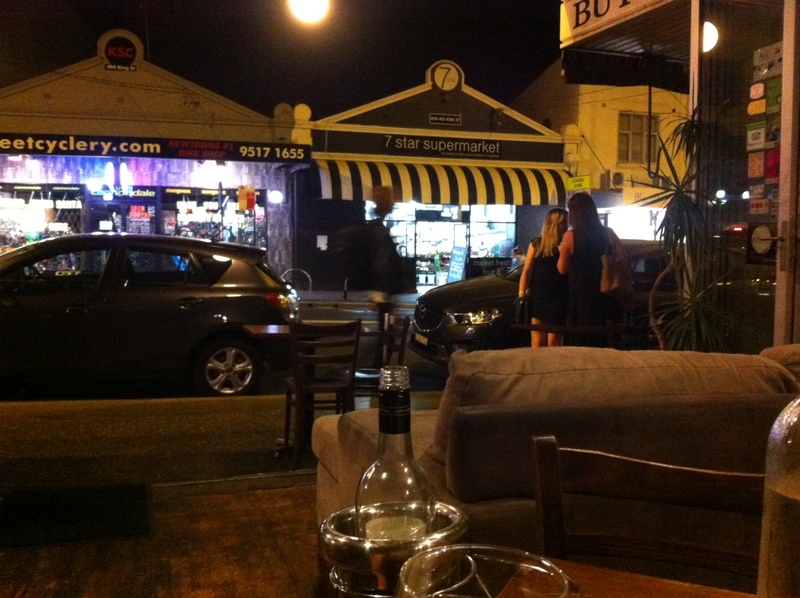 The generous open-to-the-street, double-wide room gives plenty of seating options but it does leave it looking sparsely populated even when there are quite a few punters enjoying themselves inside. Our visit was at the end of a hot day, with the promise of a relieving southerly buster on the horizon. I was running late because I had to take home a large box of books that had been delivered to work. Did I mention that I had written a book? You can get it on Amazon and lots of other places. Getting off a crowded bus without bashing someone with a box of books while you wield your opal card is quite a feat let me tell you. By the time I had dropped the books at home and walked the dog, I had to hustle up the hill to Newtown. The frontline of Painting the Bridge is getting further and further away and the journey each week is getting a little bit longer. Of course being a Friday night near the end of the year, and at the end of a hot day, the streets were full of party-mode pedestrians, who didn’t seem to understand that letting me through was more important than their discussion about Darren’s new piercing or Louise’s new tatt. So I was just about ready for a beer when I arrived. Strop was already there deep in conversation with the Stropolina. This was a pleasant surprise, I’d thought it was just the two of us tonight. But unfortunately the Stropolina was only making a brief stop, taking mercy on her aged parents, and was soon on her way to re-join the party-mode pedestrian throng. Strop had chosen a table near the front with an excellent view of the street and of the supermarket opposite. 2042 has a much nicer vibe from the inside, especially when you have a beer in front of you. There were a few other people also enjoying the vibe but the room was far from full. During the evening we watched a lot of people walking back and forth on King Street, often stopping to check out the menu on display at the front, and mostly keeping on meandering. I felt like shouting “Come on in, you’ll like it.” But of course I didn’t. It wasn’t until the Stropolina had departed and Strop had done her Facebook checking-in thing that we were able to seriously consider the menu. My first glimpse immediately set off my quinoa and kale alarms but I was soon placated by the presence of pork belly – there were at least two dishes featuring the underside of a pig, and one of them was cooked twice. Unfortunately due to the heat neither of us felt like a heavy meal, which was a pity because there were a lot of nice, but substantial-sounding things on offer. To start we chose a cold meat platter, and because I couldn’t make up my mind between the Jamon Iberico (32 months), and the Jamon Serano (18 months), let alone the Shulz Smoked Wagyu, we decided to have All the Meats. And a bottle of your finest rose please. Yummo. The smoked beef won the battle of the meats, but the Jamons were very nice too, each in their own subtle hammy way. The board included very nice fat Sicilian olives and some pickles. The bread was pre-drizzled with olive oil and sprinkled with a bit too much salt. All the Meats turned out be Quite a Lot, so we decided to take it easy on the next round because we were in the mood for dessert. We decided to share a salad and some polenta chips, which was probably an error as the salad included polenta too. Oh well. The blue cheese dipping sauce that came with the chips was very good, better than Bloodwood’s version I thought. More delicate. The salad was good too, but the dressing seemed a bit sweet. For dessert I couldn’t go past the affogato with Frangelico, Strop had a disappointing creme brûlée that she thought was a bit rubbery, and came with an enormous pile of super crunchy praline. That she left some of the praline on her plate says that the pile was too large. We left the restaurant just as the southerly buster finally hit, bringing a stinging blast of grit to pepper the backs of our legs as we walked home. Having given the day time menu a bit of a glancing at, I am keen to go back and check out 2042’s breakfast offerings sometime, but it’s a long way to walk that early in the day. Hey Andy, still enjoying the blog since our foray into paintingbridgeness. Where can I get your book? I’d like to buy it locally seeing as it’s set around here, but couldn’t find it in the usual suspects – Better Read Than Dead etc. Is it hanging out in a bookshop somewhere or only online? it’s really hard to get a first-time author’s book into bookshops at any time – but especially in the lead up to Christmas – so we’re going to try the local independent bookshops in the new year. But you can get a paperback printed ‘on-demand’ through or an e-copy for your e-reader … follow the leads by clicking through to Left Luggage from the front page of the blog. Or even better, come to the ‘launch’ on Saturday where there’ll be paperbacks on sale for $20 each – if you take one with the author’s signature it will only be $15! !